Raise your hand if you've ever said that about your dog. No judgement. Get 'em up there. That phrase is one I frequently hear when initially meeting families for Training. It's usually based on the "guilty look." A fascinating study was done that involved two groups of dogs and their owners. Both groups of owners received the same instructions: go into the room and tell your dog not to eat the treat; leave the room, the treat and the dog and then return a short while later. In the first group, the dogs, being opportunistic eaters, ate the treat when the owners left. In the second group, the researchers removed the treat after the owner left, but before the dog could eat it. When both groups of owners returned, they saw the treat was gone and scolded their dogs for disobeying. Do you know what the dogs did? In both groups the dogs displayed the "guilty look"--even the dogs who hadn't eaten the treat! What we humans label as guilt in dogs is actually a cluster of deference behaviors. It's the dog saying, "Woah, dude. I can see you're upset about something, but let's just be chill here. I want to live peaceably with you. Please don't hurt me." The dog is actually responding to what he perceives as a threat. To label the behavior "guilt" is to assume that the dog remembers certain guidelines for his behavior, remembers that he has broken those guidelines and is feeling guilty about that disobedience. Can dogs remember all that? Are their brains capable of that level of thought? Do they even have an ethical system of good and bad, such that knowing a behavior is "bad" inhibits them from practicing that behavior? While it may be true that dogs have an ethical system, it doesn't necessarily mimic ours. In fact, I think it's very safe to say that it doesn't match ours at all. If it did, there wouldn't be conflict over peeing in the house, digging in the trash, taking food off the counter, jumping up to lick your face in greeting, sniffing crotches, etc. If the canine hardwired ethical system mirrored ours we might expect guilt. And I might be out of a job. Without an ethical system dictating good and bad, there is no basis for guilt. To assume the dog feels guilt over what offends us is to assume that their ethical system matches ours. 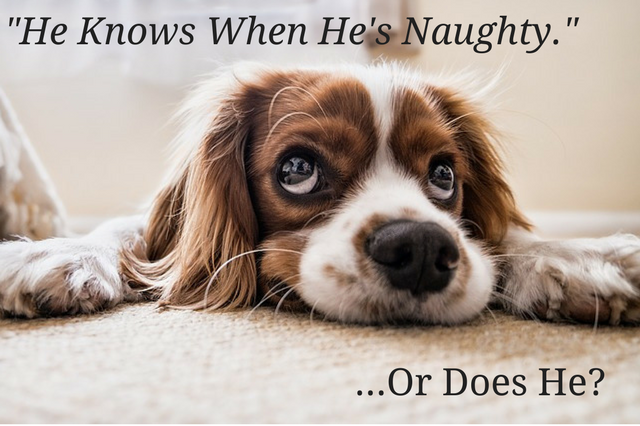 The "guilty look" is a cluster of deference behaviors the dogs displays based on owner behavior, not their own past behavior.